It would not surprise Data Rant if Louis van Gaal and Ed Woodward are being guided by a team of statisticians both on the pitch and in the transfer market. Indeed, Van Gaal has often spoke fondly of “computer gurus,” while Opta has long offered highly detailed data to professional football teams – much more so than anything available to the public. Given this, an elementary, statistical, approach to the transfer market can be revealing. Manchester United clearly needs a central defender – though this appears more or less straightforward with Sergio Ramos or Nicolas Otamendi seemingly bound for Old Trafford. The situation up top is more complicated though. In an ongoing series we continue to use the ‘Moneyball’ approach to player analysis – this time to look at how the Reds’ forward line measures up to Chelsea, Manchester City and Arsenal. Only forwards who made at least 25 appearances last season have been considered and their statistics have been compiled into each club’s ‘representative’ forward. In Table 1, above, United’s attack compares very poorly to the club’s direct rivals. Wayne Rooney and his colleagues do not contribute as many goals to the team’s cause as, for example, Diego Costa or Sergio Aguero, while United’s forwards are far more static in comparison to rivals’. We tighten the measurement by limiting our analysis to three forwards given that Van Gaal will likely use a 4-3-3 this season. The data places Rooney and Juan Mata as two of the front three, with new recruit Memphis Depay leapfroging Ashley Young to take up the left-wing berth. Assuming that Depay performs at least as well as he did in the Erevidise, United’s numbers look a lot better. In Table 2, above, this theoretical front three pulls its weight in terms of contribution to total team goals. The likely absence of Maroune Fellaini means that United’s midfield will be more measured and cultured, with less inclination to ‘verticality’. However, Depay, Rooney and Mata will have to make up for that lack of attacking thrust from deep. Even in this formation the Reds lag behind Chelsea, City and Arsenal in the number of dribbles per appearance. Data Rant’s earlier look at Danny Welbeck revealed a strong relationship between goals and take-on attempts. This suggests that Depay’s ability to go past players may increase United’s goal output even further. This analysis suggests that, in an ideal world, United will strengthen the forward line so that runs-per-appearance measures at least two. This number would put the Reds on an even footing with City and Arsenal, with a fighting chance of matching Chelsea’s output. There has been much talk of signing a world-class forward this summer, but it makes little footballing sense to deploy Rooney in midfield in the coming season – assuming a 4-3-3 – with the club having acquired Bastian Schweinsteiger and Morgan Schneiderlin. And while Van Gaal has never been afraid to drop a star from his team, any omission of the United captain must be predicated by the recruitment of a striker who is clearly better than the former Everton player. 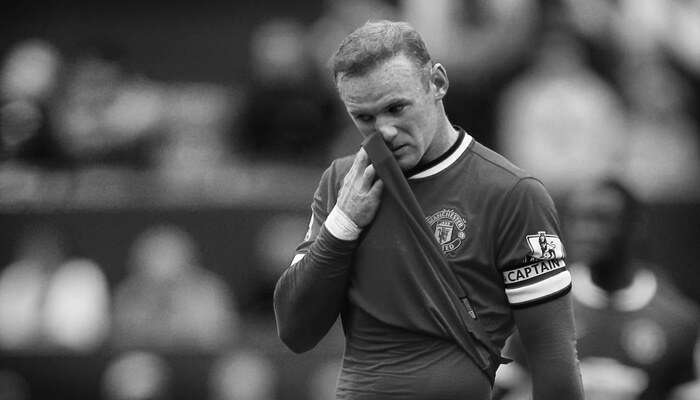 Rooney could not, for example, complain about losing his place to Lionel Messi! Surprisingly, perhaps, this analysis finds no striker who meets the above criteria. Lyon’s Alexandre Lacazette is better than Rooney on every criteria, but falls well short of attempting 225 per cent more take-ons than Rooney. This makes sense. Rooney’s 1.2 runs-per-appearance is good for a striker who rarely has space to run at defenders. Meanwhile, promising forwards such as Harry Kane may be worth a look, but the data shows there is not obviously a striker who will be an upgrade on Rooney. An alternative strategy, given that United desperately needs more runners in the attacking third, is to bring in a genuine right-winger. In Table 3 we look at alternates. United has been strongly linked with Barcelona’s Pedro of late, but the move makes little sense in terms of the numbers. The Reds require a winger who attempts at least 2.1 runs per appearance. Pedro is at 0.6 – the same as Mata. However, Pedro is more creative than Mata and Van Gaal might conclude that the extra creativity in the final third may compensate for the lack of take-ons – the Barcelona winger is more of a “false winger” than genuine wide man. The transfer, if it materialises, must be considered an attempt at upgrading Mata. Recent speculation surrounding Thomas Muller supports the theory that Van Gaal is seeking a better false winger. Gareth Bale is an expensive option, but one that will improve United’s forward line by adding much needed thrust to the front three – to the point that United’s attack would be comparable to rivals’. Data Rant’s search of wingers in England, Spain, Germany, Italy and France has revealed Hoffenheim’s Kevin Volland as a cheaper potential transfer target to bridge the gap between United and Chelsea. In pure numbers Volland is better than Mata in every way. Depending on how highly Van Gaal values James Wilson United may also add a promising young striker to the squad. A bona-fide superstar, however, makes little sense if 4-3-3 continues to be Van Gaal’s preferred system. At present a right-winger will improve the Reds’ attack more than a striker. great piece. Assuming that Depay performs at least as well as he did in the Erevidise seems a tad optimistic tho, no? Brilliant analysis. This site is best when it comes to statistical analysis. I have been reading articles for quite some time but was really inclined to comment this time around. If you look at the table in the article, you will notice that even when he is not scoring on his own he is setting up goals for others. So basically he has directly contributed 23 goals each season. Only two seasons he played as an out and out striker and he smashed 26 & 27 goals in them. In those season providers were Nani and Valencia. In other seasons when our wingers were not flourishing it was Rooney who provided for Berba and RVP. He also played second fiddle to Ronaldo and Ruud in earlier years. Not only this he played no. 10 last year for assisting Falcao and RVP, both of whom were awful. Rooney still got more goals than both despite of the fact that he played half the season in midfield. Despite of all the stats and sacrifices he still gets a flak from supporters. But our club is lucky that we have had managers who regarded him vital to our success. His versatility has been a bane for him sometimes. If he had been assisted more by likes of Nani, Young and Valencia he just might have scored more goals. With LVGs faith in him I think he will flourish this season. Also we have a top class midfield to assist him this season. GGMU. I do not think a team looking to continually threaten another good team can afford to have a striker who struggles to hold the ball up whilst facing pressure from a defender (Rooney’s main weaknes) Add this to the fact Rooney can not threaten in behind particularly well due to his lack of pick up speed and a team becomes to easy to play against. I beleive these facts negate the excellent shooting and good numbers he offers. When Rooney leaves Utd a new life will be breathed into the team, whilst perhaps missing some goal threat at least at first, we will be a team who looks like scoring more goals. This will equate to watching more exciting dynamic ‘Utd esk’ football whilst simultaneously providing remedy for the slow mechanised football that is perhaps the LVG weakness. RVP more so due to poor back- to-goal-movement, again in holding the ball up but also Rooney have damaged Utd’s offensive shape for years. This was reason for the fact that despite his abysmal goal return we looked a better team when Welbeck played. A concern for me is United’s lack of a high-class crosser on either flank and Rooney’s questionable level of mobility when playing up front on his own. Great article. The data is top line stuff though. contributing factors, such as the formation in which other teams play, team mate quality, playing style etc, limit the quality of it though. for example, if you put Rooney in a Chelsea team, anywhere across the front three, his stats will automatically be higher, given the strength of the rest of the team and the style of play.. I like where you are going with it, but the algorithms required to get to A1 data are very complex. i’d love to know what algorithms power opta and prosports software!